July 28, 2006: In 1959, a spaceship fell out of the lunar sky and hit the ground near the Sea of Serenity. The ship itself was shattered, but its mission was a success. 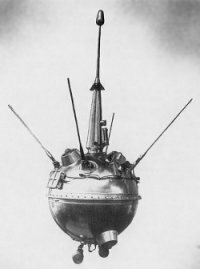 Luna 2 from the Soviet Union had became the first manmade object to "land" on the Moon. This may seem hard to believe, but Luna 2 started a trend: Crash landing on the Moon, on purpose. Dozens of spaceships have done it. NASA's first kamikazes were the Rangers, built and launched in the early 1960s. Five times, these car-sized spaceships plunged into the Moon, cameras clicking all the way down. They captured the first detailed images of lunar craters, then rocks and soil, then oblivion. Data beamed back to Earth about the Moon's surface were crucial to the success of later Apollo missions. Even after NASA mastered soft landings, however, the crashing continued. In the late 1960s and early 70s, mission controllers routinely guided massive Saturn rocket boosters into the Moon to make the ground shake for Apollo seismometers. Crashing was much easier than orbiting, they discovered. The Moon's uneven gravity field tugs on satellites in strange ways, and without frequent course corrections, orbiters tend to veer into the ground. Thus the Moon became a convenient graveyard for old spaceships: All five of NASA's Lunar Orbiters (1966-1972), four Soviet Luna probes (1959-1965), two Apollo sub-satellites (1970-1971), Japan's Hiten spacecraft (1993) and NASA's Lunar Prospector (1999) ended up in craters of their own making. 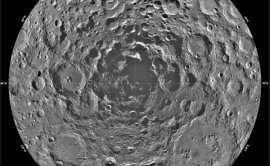 "We think there's frozen water hiding inside some of the Moon's permanently-shadowed craters. So we're going to hit one of those craters, kick up some debris, and analyze the impact plumes for signs of water." The experiment couldn't be more important. NASA is returning to the Moon, and when explorers get there, they'll need water. Water can be split into hydrogen for rocket fuel and oxygen for breathing. It can be mixed with moondust to make concrete, a building material. Water makes an excellent radiation shield, and when you get thirsty you can drink it. One option is to ship water directly from Earth, but that's expensive. A better idea would be to mine water directly from the lunar soil. But is it there? That's what LCROSS aims to find out. The quest begins in late 2008 when LCROSS leaves Earth tucked inside the same rocket as Lunar Reconnaissance Orbiter (LRO), a larger spacecraft on a scouting mission of its own. After launch, the two ships will split up and head for the Moon, LRO to orbit, LCROSS to crash. Actually, says Colaprete, "we're going to crash twice." LCROSS is a double spacecraft: a small, smart mothership and a big, not-so-smart rocket booster. The mothership is called the "Shepherding Spacecraft" because it shepherds the booster to the Moon. They'll travel to the Moon together, but hit separately. The booster strikes first, a savage blow transforming 2-tons of mass and 10 billion joules of kinetic energy into a blinding flash of heat and light. Researchers expect the impact to gouge a crater ~20 meters wide and throw up a plume of debris as high as 40 km. Close behind, the Shepherding Spacecraft will photograph the impact and then fly right through the debris plume. Onboard spectrometers can analyze the sunlit plume for signs of water (H2O), water fragments (OH), salts, clays, hydrated minerals and assorted organic molecules. "If there's water there, or anything else interesting, we'll find it," says Colaprete. The Shepherd then begins its own death plunge. Like the old Rangers, it will dive toward the lunar surface, cameras clicking. Back on Earth, mission controllers will see the booster's glowing crater swell to fill the field of view--an exhilarating rush. Until the very end, the Shepherd's spectrometers will keep sniffing for water. "We'll be able to monitor the data stream down to 10 seconds before impact," says Colaprete. "And we should have enough control to land within 100 meters of the booster's crash site." The Shepherd is 1/3rd lighter than the booster, so its impact will be proportionally smaller. Nevertheless, the Shepherd will make its own crater and plume, adding to those of the booster. Astronomers hope the combined plumes will be visible from Earth, allowing observations to continue even after the Shepherd is destroyed. Many readers will remember the crash of Lunar Prospector in 1999. Mission controllers guided the ship into Shoemaker crater near the Moon's south pole in hopes of kicking up waterâ€”just like LCROSS. But no water was found. "LCROSS has a better chance of success," says Colaprete. For one thing, LCROSS delivers more than 200 times the impact energy of Lunar Prospector, excavating a deeper crater and throwing debris higher where it can be plainly seen. While Lunar Prospector's plume was observed only by telescopes on Earth a quarter-million miles away, LCROSS's plume will be analyzed by the Shepherding Spacecraft at point blank range, using instruments specifically designed for the purpose. Only one question remains: Where will LCROSS strike? "We haven't decided," he says. The best places are probably polar craters with shadowy bottoms where water deposited by comets long ago may have frozen and survived to the present-day. Less orthodox choices include canyons, rilles and lava tubes. "There are many candidates. We're convening a meeting of researchers to debate the merits of various sites and, finally, to pick one." Amateur astronomers: Using 6-inch or larger backyard telescopes, you might be able to see the LCROSS impact flashes. For a split-second, the explosions will glow about as brightly as 7th or 8th magnitude stars. But there's a catch: "If we land inside a deep polar crater, the flashes could be hidden by steep crater walls," says Colaprete. "We'll know more after a landing site is chosen." Spacecraft that have hit the Moon: Luna 2, NASA's Rangers and Lunar Orbiters, Lunar Prospector, Japan's Hiten.